Today’s view is our “almost” second home in Waikoloa on the westside of The Big Island. The weather here is sunnier than any other spot in Hawaii. 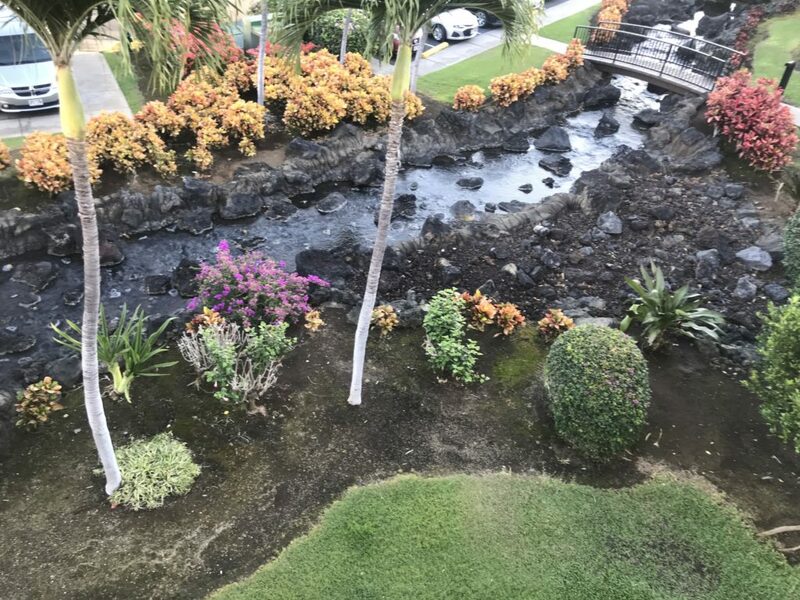 Even when the rains are coming down in Hilo or the vog has blown into Kona, Waikoloa offers cloudless blue sky with year-round moderately warm daily temperatures. Hilton Grand Vacations has four timeshare communities in Waikoloa. We almost succumbed to buying a new one at Kings Land a few years ago. The process taught me a great deal about how the timeshare industry work. More about the good, the bad and the ugly of timeshares in another post! We discovered the resale timeshare market and bought in Las Vegas and Park City for 5% of what the new units cost. It’s been wonderful because we can apply our yearly points to any Hilton Grand Vacation properties. We can also buy nights within 30 days of the stay at less than the cost of a hotel. 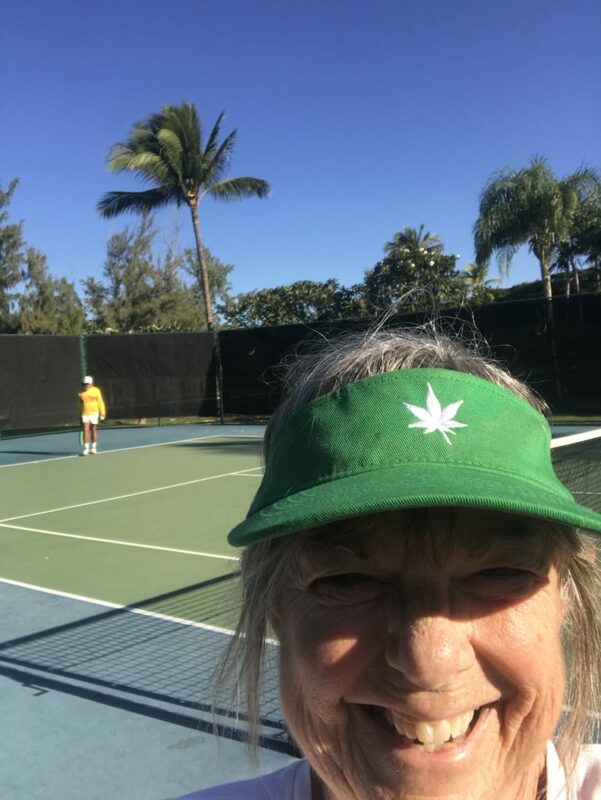 We like staying at Bay Club because of the tennis courts. Sometimes, we are the only people using them. This trip, there are a couple of other men that are playing. The courts are impeccably maintained and their use is included when we stay here. The best breakfast on the island is served up today on our lanai (patio) from the full kitchen. We are enjoying fresh Ono (from Costco!) 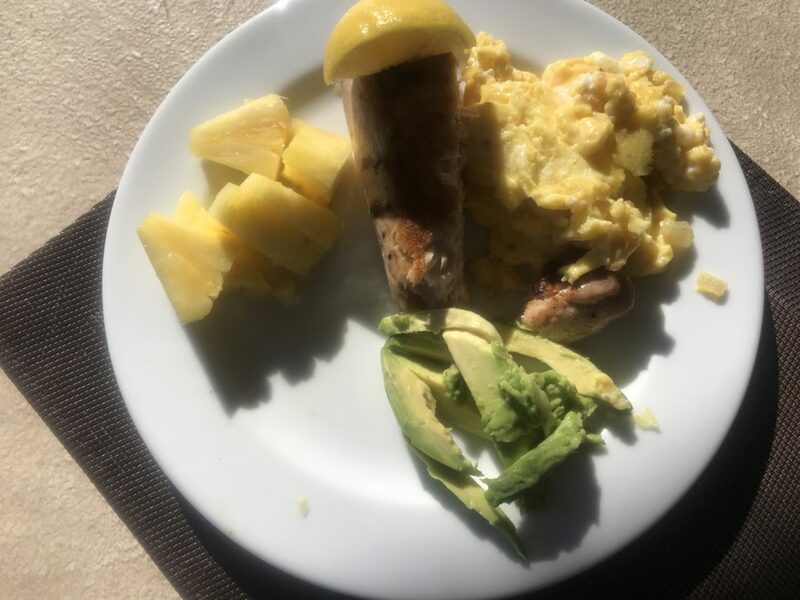 along with sweet pineapple, scrambled eggs, and local avocado. Kona coffee (Bub is drinking his laced with Kahlua) completes our morning feast. This trip we are staying in a 1 Bedroom unit complete with a washer/dryer, full kitchen, 2 flat screen TVs with access to 2 DVDs a day. The wraparound lanai allows sunbathing right off the living room. Or a pool and hot tub are directly out front of our home in Building 3. It’s time for me to go lay by the pool and do some sunning and reading! I’m so jealous…. It is still too cold here in sunny Arizona!